ahh!! couldn’t you just squeeze that kid?! so cute! I do love him. 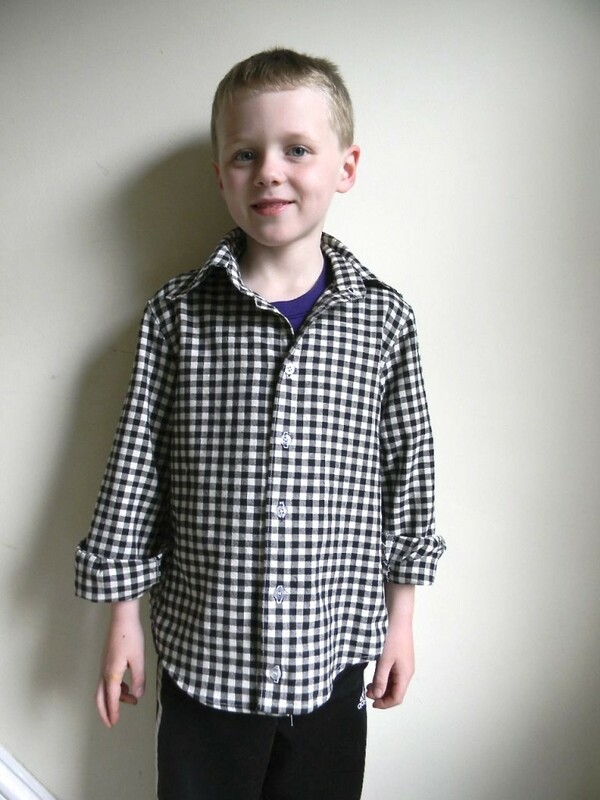 I’m swinging right back into ‘regular life’ (after my dreamy time at the makerie) with lots of kids clothes week sewing. well, not really LOTS since I’ve only made one shirt and it’s already thursday. but, I have lots of plans for lots of sewing and that has to count for something. with this shirt I was aiming for a guaranteed home run. 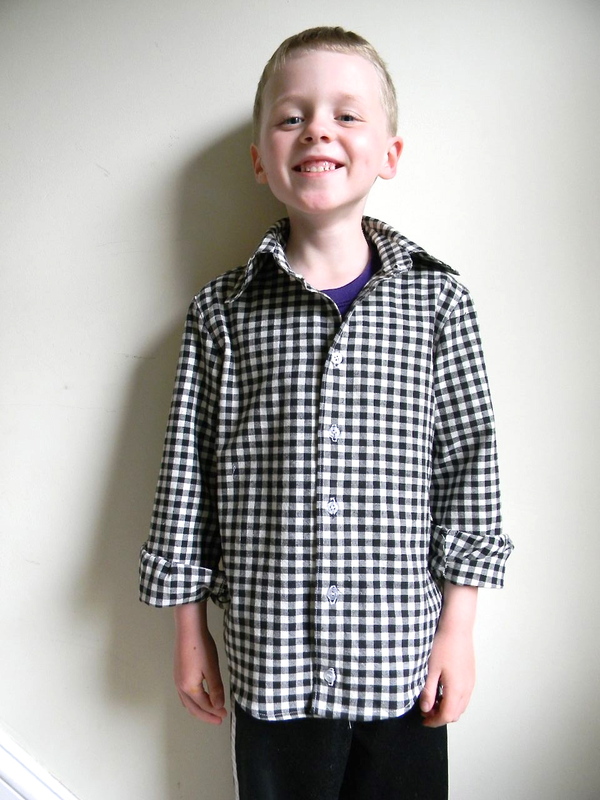 C picked the fabric himself (from out of my stash) and it is a soft, flannel-like check that I got at a yard sale. he requested that I make it into a ‘handsome shirt’. this is his thing. it has been for approximately a year. he wears a button up shirt nearly every day and he calls them “handsome shirts” because while he might be a humble ‘man of the woods’ on the surface if you dig deeper it’s clear he knows he is super cute (he also has a handsome hat that sees just as much wear as the shirts). thankfully, we have a lot of handsome shirts but they are getting small. mostly they are small in the arms…his arms seem to be stretching out every single day. what is up with that? 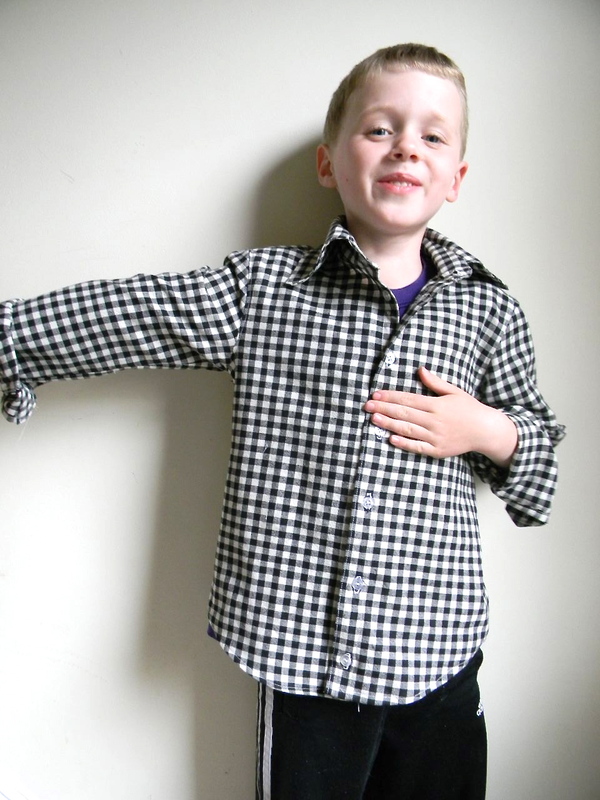 I was excited to take on the challenge of this shirt with it’s buttons and arm cuffs and collar with collar extender. turns out it was more of a challenge than it even should have been. 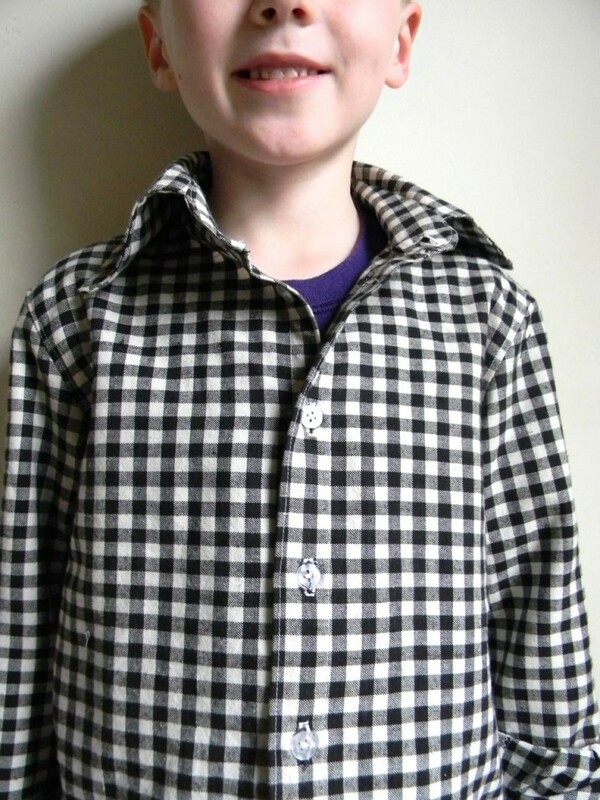 the pattern is from the book sewn with love by fiona bell of their nibs fame. unfortunately, there were quite a few problems both with the pattern and the instructions. the start with, the patterns come on a cd and are printed out, which adds the time-consuming element of taping together the pattern before you even trace it. this is annoying step, no matter what, but it is especially difficult in this case because the pattern pieces don’t come together very easily. it’s confusing and in some places I had to draft portions myself! which is flatly ridiculous when you’ve paid for a book and taken the time to print out and tape together a pattern. on top of that, the pattern instructions are not very clear and there are very few pictures. I was really hoping to learn how to make cuffs with a sleeve packet and the instructions were so confusing I just had to wing it and make it up and put in a simple placket….meaning I learned nothing. arghh!! as frustrating as the process was, I really like the end result. the arms a little long (but not for long!) and he insists on wearing them rolled up. I will probably make more of these now that I have the pattern and cracked the code on the pattern. if you know of a great tutorial or youtube video on making a sleeve placket PLEASE let me know! I would love to learn how to do that properly. the best news of all is that after initially rejecting the shirt (I hate it! I won’t wear it! ), I paid him 75 cents he tried it on and he likes it now. phew. now, it’s back to kids sewing and pattern code cracking for me! Bribery! I love it! I also love that he calls them handsome shirts–I’m totally stealing that. I’m sorry to hear about the book, but thank you for being honest about it. I am a new oliver + s convert and it’s totally because of their super clear directions. They must have a handsome shirt pattern. Congratulation on the shirt! It is no small thing that you made it. Well done! Oliver + S is a great idea. Leisl was at the Makerie and you can just tell she is an exacting and talented seamstress (I didn’t take her workshop but only because I had to make some tough choices.) I will look into that. And, oh yes, bribery is rampant at our house. You could check out Day 9 of the Archer sew along over at Grainline. That’s the day she did plackets. Pam also has tons of tutorials and vids over at http://off-the-cuff-style.blogspot.com/ Shirt making is her business so she knows all the tricks. Fantastic Barbara! Great tips, I’m going to have to check those out. Funny you mention that! I did a (brief) search yesterday and came across portions of that sew-along. It looked amazing but in the short time I had I didn’t find the sleeve packet portion and then my mama-brain promptly forgot about it. Good tip, friend. I’m gonna check that link out. This is so fantastic…all my questions answered on this thread. Man, the internet is thoroughly amazing!